Quebec's new leader is promising to get right to work to reduce immigration and to stop public employees from wearing religious symbols in the workplace. Francois Legault said on Tuesday he was ready to use the notwithstanding clause in order to ban civil servants from wearing religious symbols, and that it’s something the majority of Quebecers want. "If we have to use the notwithstanding clause to apply what we want, the vast majority will agree," said Legault. The CAQ has long said the provincial Liberals didn't go far enough with religious neutrality and that a CAQ government would pass a secular charter banning public employees such as police officers and teachers from wearing religious symbols including the hijab. Legault's plan is deeply concerning to Shaheen Ashraf of the Canadian Council of Muslim Women. She says ultimately it's a human rights issue. "If a person like me wants to be a police woman, or wants to be a teacher or wants to be in the public service or in politics, I can’t?" she said. "I mean where’s my Canada?" Ashraf also said it feels like 2013 all over again. "You know it’s the same thing that happened when Marois started the secular charter, charte des valeurs," she said. Legault also said he plans to move quickly to fulfill his promise of reducing the number of immigrants allowed to enter Quebec by 20 percent. Legault repeatedly said during the campaign that he wanted to reduce the number of immigrants coming to Quebec, and that won acclaim from the anti-immigrant Rassemblement National in France. That party's leader, Marine Le Pen, celebrated Quebec's vote "for less immigration. The lucidity and closedness facing migrants is the common ground of elections in almost all countries facing this issue." French newspaper Le Parisien compared Legault to Donald Trump, but also noted that massive numbers of Quebecers failed to vote. Meanwhile the federal government wants to hear from the CAQ about the party's plan to remove immigrants who cannot pass a "simple" values and language test. Legault will be leading a strong majority, with 74 CAQ MNAs in the National Assembly, although the CAQ won a majority with just 37 percent of the popular vote, the lowest majority-granting numeber in the province's history. Quebec's new leader also promised to get right to work to change how the province is governed. Francois Legault said Tuesday that one of his first priorities will be to talk to Federal Foreign Affairs Minister Chrystia Freeland about the new United States-Mexico-Canada Agreement. He also said he's going to work on building a strong relationship with the federal government. 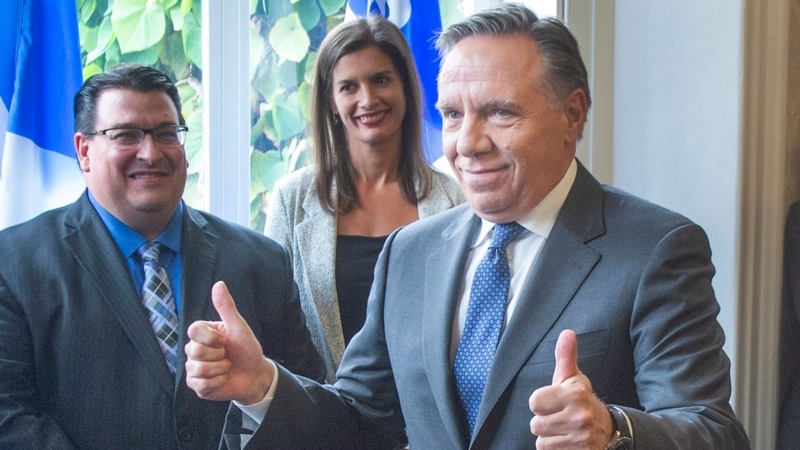 "I want to assure the rest of Canada of my will to build a stronger Quebec within Canada, in a win-win relationship," said Legault. The premier-designate thanked Quebecers for their confidence and would do his best to respect their choices. Speaking in English, he said "Yesterday was historic, the election of the first CAQ government." "For the first time in half a century neither the Liberals nor the PQ are in office. Myself and my team will govern for all Quebecers," said Legault. "We will focus on three clear priorities in the weeks ahead. One, we will ensure a strong economy, better-paying jobs and we'll put money back in Quebecer's pockets," said Legault. His other primary tasks included dealing with education, and health care and care for the elderly.